We just released a new exciting feature… the Broken Link Checker! 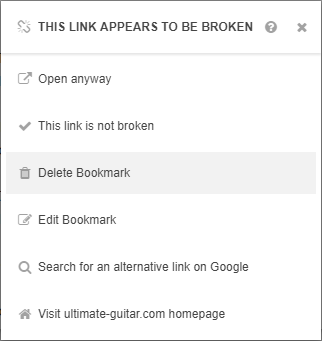 The Broken Link checker will tell you which of your links are (most likely) broken, so you can remove them. This will help you keep your bookmark collections organized and stops you from visiting dead ends. Links that we’ve identified as broken will now be displayed as Link title in your bookmark widget. We hope that this new feature will make it easier for your to clean up your old bookmarks. Happy housekeeping! Please leave a comment below or e-mail your suggestions/feedback to support@start.me. The Broken Link Checker is only available to PRO subscribers. Not a PRO subscriber yet? For just $20/annually or $50/lifetime you get access to all premium features and an ad-free experience. For more information: https://start.me/pro. This is great. I already cleaned up half a dozen links. Keep adding features like this! Thanks for adding broken link checker tool. Yes, you are right, I have 25+ websites and this tool really help me to remove broken links from my websites.